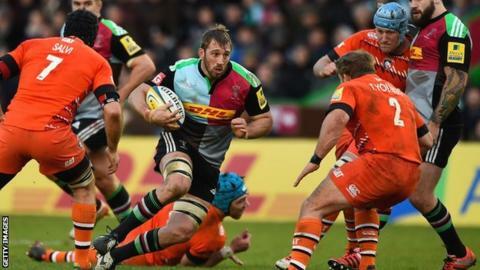 England captain Chris Robshaw made a winning return to action as Harlequins overcame Leicester at The Stoop. Visiting fly-half Owen Williams put his side ahead with two early penalties but tries by Danny Care and Jack Clifford meant Quins led 15-9 at the break. Marland Yarde scored their third touchdown, which Ben Botica converted before adding his second penalty. Williams kicked another penalty in reply but replacement Tim Swiel's late score secured Harlequins' bonus point. While many eyes were on the returning England captain, it was his back-row colleague Nick Easter, making his 250th appearance for Quins, who put in a man-of-the-match performance to revive his side's hopes of reaching the top four. Following victories for Harlequins and Sale Sharks on Saturday, just 14 points separate the top eight sides in the Premiership after 13 rounds of fixtures. At the end of last season that gap was 43 points. The 36-year-old number eight had a hand in three of his side's four tries, as the hosts bounced back from a slow start. The Tigers were looking for their fifth win in six Premiership matches and three early penalties from Williams gave them the best possible start. One of the game's fascinating match-ups was at scrum-half, where both Care and Ben Youngs have designs on a starting place in England's Six Nations opener. It was the Harlequins nine who came out on top on this occasion - and it was Care who also scored the first try of the match, timing his run to perfection to latch on to Easter's offload. Botica's conversion, which added to his earlier penalty, gave Quins a lead they would never relinquish. Easter's drive was the catalyst for their second try, with former England Under-20 captain Clifford eventually crossing after neat work from Care and Yarde, and Quins held a 15-9 advantage at half-time. Four minutes into the second period the hosts grabbed their third touchdown, with Easter claiming Williams' poor clearance and feeding Yarde. The England winger somehow threaded his way through a wall of Leicester defenders to give his side a healthy advantage. In a rather dull last quarter in which Williams added his fourth penalty, the bonus point appeared to have eluded Quins until England full-back Mike Brown created a chance for replacement Swiel to score in injury time, which he converted himself. I've stopped speaking to [England head coach] Stuart Lancaster about because I'm banging... Nick wants to play for England. "Stuart's worry has always been, will he get to the World Cup with the ability to play at that intensity and pace? Look at that performance against Leicester and think about the Leinster games when he played against Jamie Heaslip. "I've been very fortunate to have Nick at the club while I've been here - he plays at a level very few people can - that offload [for Care] wasn't just world class, it was out of this world. "The harder the going gets and the more we're under pressure, the better he plays - I said to him four years ago I'd stop playing him every week, but I can't stop playing him every week." Leicester Tigers: Tait; Thompstone, Goneva, Allen, Benjamin; Williams, Ben Youngs (capt); Ayerza, Tom Youngs, Balmain; Kitchener, Parling; Croft, Salvi, Crane. Replacements: Ghiraldini, Rizzo, Mulipola, De Chaves, Gibson, Harrison, Burns. Bai. Harlequins: Brown; Yarde, Hopper, Lowe, Monye; Botica, Care; Marler (capt), Gray, Sinckler; Matthews, Robson; Clifford, Robshaw, Easter. Replacements: Buchanan, Marfo, Collier, Twomey, Trayfoot, Dickson, Swiel, Williams.